NEW YORK -- Serving together in Vietnam, John Middaugh and Henry "Bill" Warner forged an Army-brothers bond they knew was profound and lasting. A world and nearly a half a century away from the war zone where they'd counted on each other, Middaugh put himself on the line for Warner this month in a new way: by giving one of his kidneys. "He had my back many times," Middaugh said as they awaited surgery last week at NewYork-Presbyterian/Weill Cornell Medical Center, across the country from his home in Port Orchard, Washington. "So this is payback time." Both are now 73. 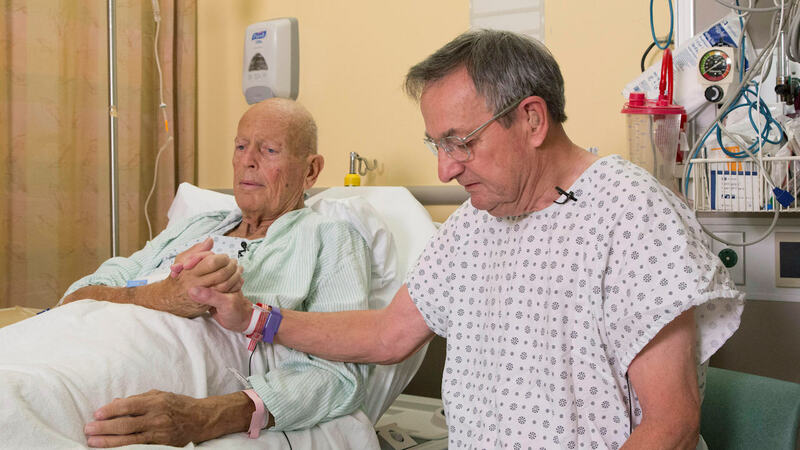 Warner, of Brightwaters, New York, had been through a health wringer since his kidneys failed after heart bypass surgery in June 2014, abruptly thrusting him into dialysis. But "we got through Vietnam. We'll get through this," Warner said. "Hey, Bill," Middaugh joked, "we got a PT formation tomorrow." Their connection goes back to March 1968 in Fort Carson, Colorado, where C Company, 1st Battalion, 11th Infantry, 1st Brigade, 5th Infantry Division, was training to go to war. Middaugh was a high school dropout from Detroit who had enlisted; he'd already completed a tour in Vietnam. Warner was a draftee who had grown up on New York's Long Island and gone to Southern Illinois University. Both had completed officer candidate school, and Middaugh was the company commander. Warner would be a platoon leader and, later, the company's executive officer. By summer 1968, they were near the northern border of what was then South Vietnam. During ensuing months of fighting, when they got a respite, they passed the time talking: about what they'd do after the Army, about the countryside around them, about the world. "When you live through those experiences, you have that bond," Warner said, and it lasted after their service together ended when Middaugh rotated to a new assignment in January 1969. Warner was discharged that year as a first lieutenant and went on to a career in the computer industry. Middaugh did a third tour in Vietnam, retired as a major in 1979, got his college degree at Pacific Lutheran University and had a second career in civil service before retiring for good in 2007. Each married, and each raised two sons and a daughter. Over the years and miles, they stayed in touch and got together for reunions. They carried with them their memories and wounds - both are Purple Heart recipients - from Vietnam. And Middaugh kept in mind a leadership principle the Army had taught him: "Know your men and look out for their welfare." So when Warner needed a kidney, and a relative and some other would-be donors proved incompatible, Middaugh didn't hesitate to jump in. "He would do the same for me," he says. Once rare, kidney transplants among senior citizens are becoming more frequent. Eighteen percent of U.S. recipients last year were over 64, compared with 2 percent in 1988, according to federal statistics. Only 3 percent of all living donors last year were 65 or older, but their ranks and percentage have grown in recent decades. In a nation where the kidney transplant waiting list tops 101,000 and 4,200 people died while awaiting a kidney last year, there has been some debate over the ethics of allocating scarce organs to older people - and, on the flip side, the ethics of determining access to the treatment by age. To NewYork-Presbyterian transplant surgery chief Dr. Sandip Kapur, the two veterans' agreement was "a compelling, appropriate situation" that stood outside such questions. Released Saturday, Middaugh said he's feeling well and glad about his choice: "It's not very often, in the course of one's life, where you can donate a gift of life to someone." Warner remains hospitalized in good condition. Recipients generally have longer recoveries than donors. They've gotten encouragement from men they served with, proud to see them "still helping each other after all these years," Warner said. "Needless to say," Middaugh said, "they weren't surprised."